Yana visited Bali in 2008. Her experience was far from amazing. Spending most of her time in Kuta and Uluwatu, she didn’t find it super exciting. The beaches were not that great, and loads of drunk people roaming the streets endlessly was not the vibe she imagined. Forward 10 years later, and our experience is completely different. We absolutely love Bali. Sure if you spend a week in Kuta, you likely won’t think fondly of Bali either. 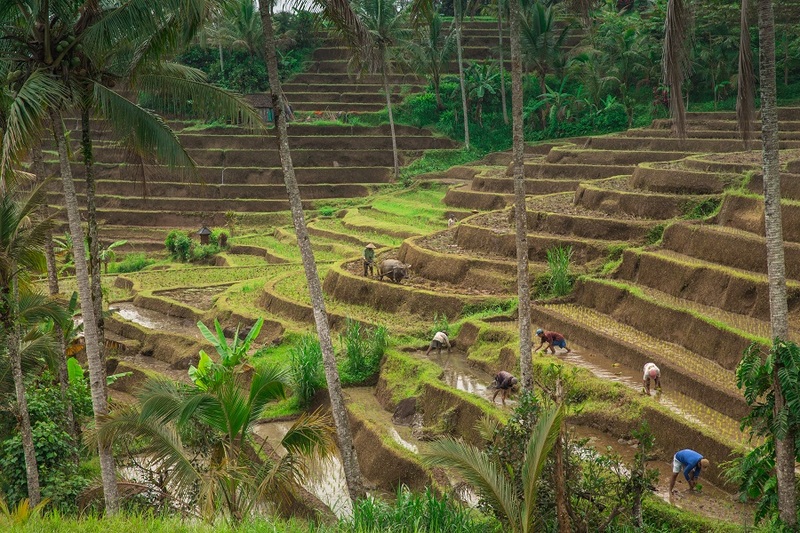 Bali has a lot more to offer than a lively party scene. 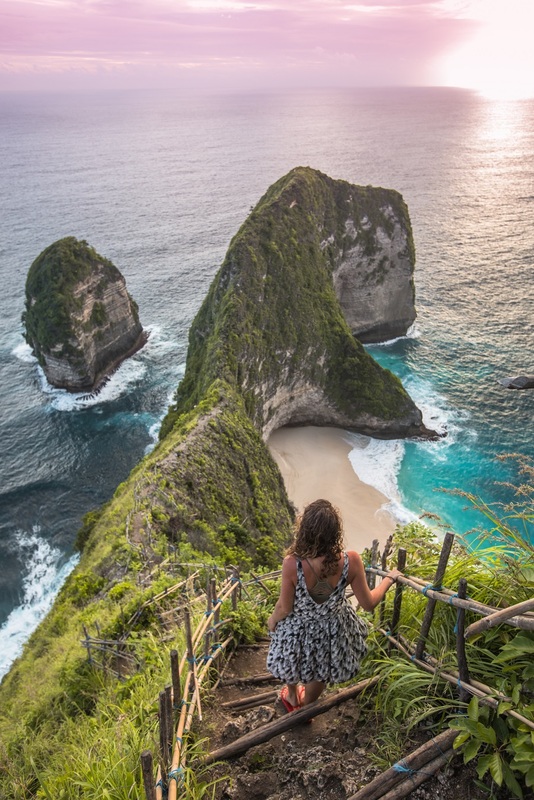 While Bali has not jumped out to us as a place that will have you in awe with jaw-dropping sights, the longer we stay, the more we love it. 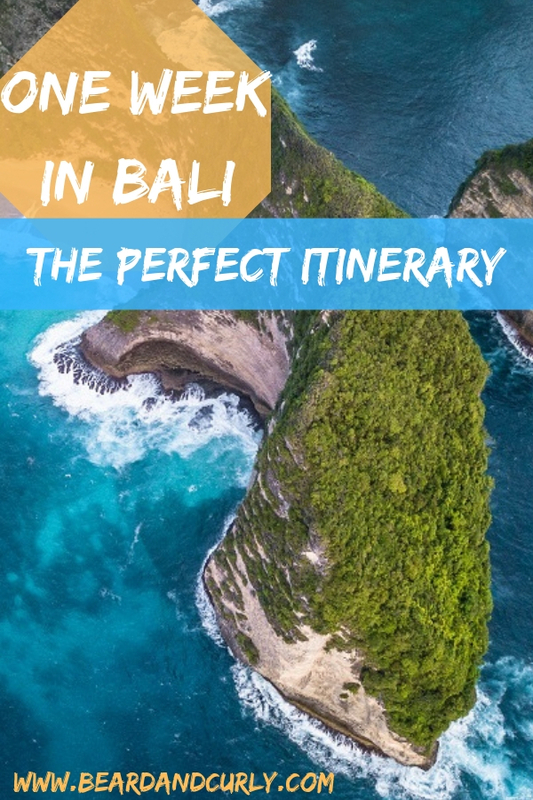 While the longer the stay the better, one week in Bali is still enough time to explore stunning temples, waterfalls, picture-perfect rice fields, and white sand beaches. 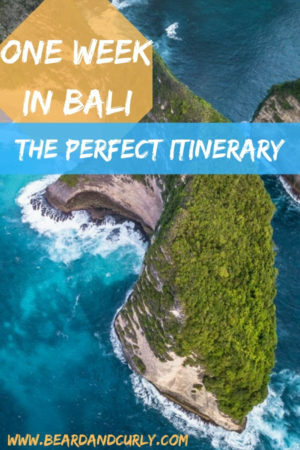 Bali has been a popular tourist destination for decades and through time, only become more popular. There is a perfect mix for both budget travelers as well as high-end luxury tourism. The culture is wonderful and the people are incredibly friendly. 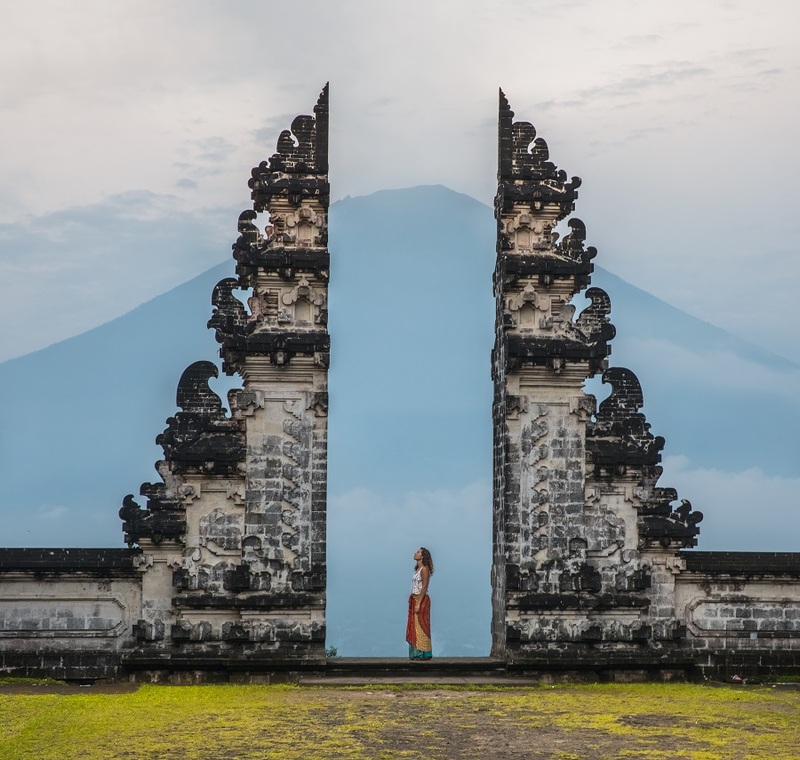 Bali is a great way to ease into Asian cultures. The food is really good and cheap. The sites are beautiful. 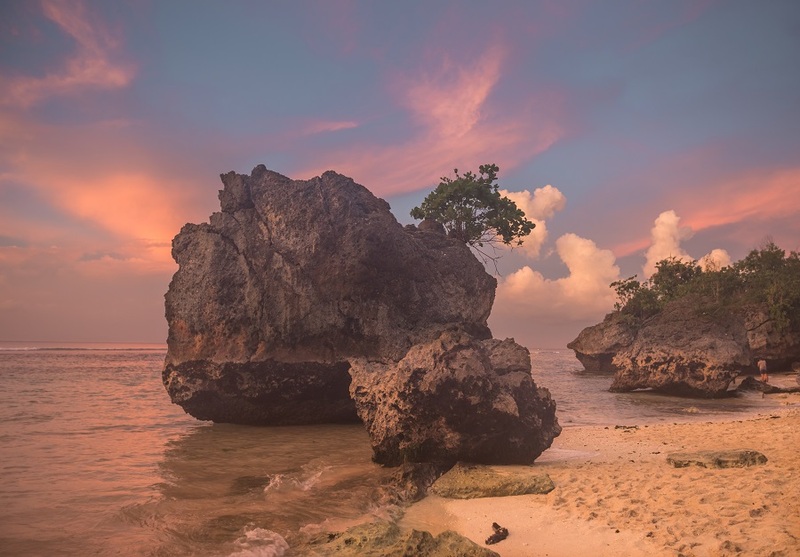 We think you can stay in Bali forever, but one week is enough time to see the main highlights. The best time to visit is during the dry season from May to November. 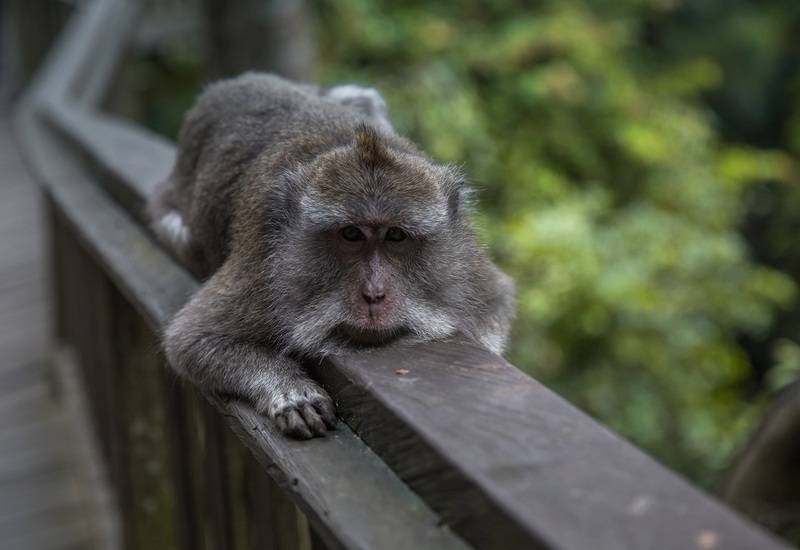 The wet season in Bali is between December and April and can be an OK time to visit. Rain normally lasts for a couple of hours. However, the beaches see a huge influx of trash due to currents. Crowds are much lower during the rainy season except during Christmas and New Years. Hiring a driver or renting a scooter are the two main sources of transportation. A driver for the day costs around 500,000 IDR ($38 USD) and hiring a scooter for the day is around 60,000 IDR ($4.50). The weekly scooter rental costs around 280,000 – 350,000 IDR ($21 – $26 USD). We recommend hiring a driver for the longer journeys between destinations and for sightseeing. It is a good idea to download the Grab or Uber app for direct journeys. To get around locally, rent a scooter. Explore: Arrive in Bali and hire a taxi or Grab car (250,000 IDR, $19 USD) to Ubud. The drive is about one and half hours from the airport. 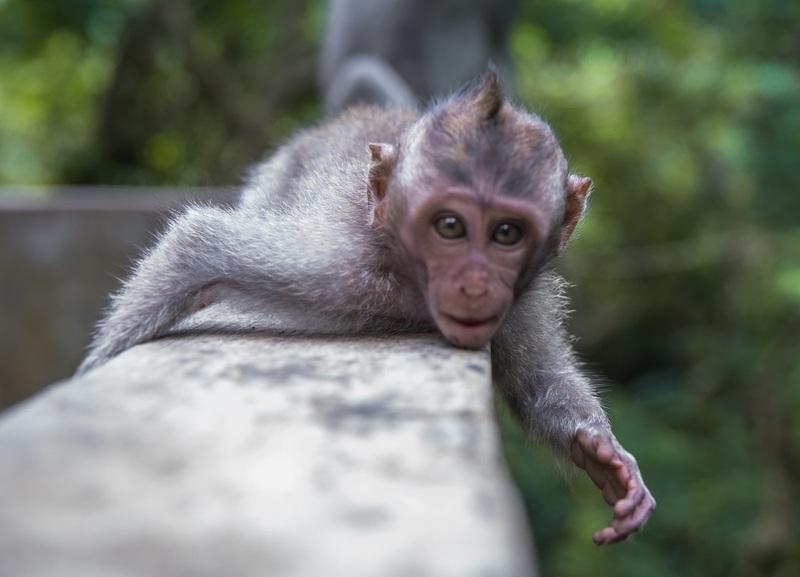 First head to the Monkey Forest Sanctuary. The entry cost is 40,000 IDR ($3 USD). 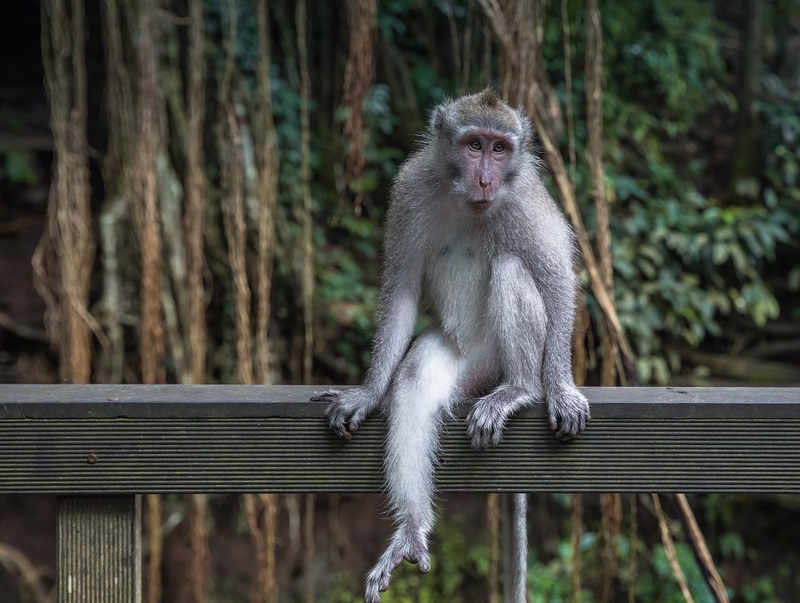 Spend one hour walking around the jungle sanctuary with hundreds of monkeys hanging about. Bananas are for sale for 20,000 IDR ($1.50 USD) and the cheeky monkeys will jump on your shoulder or head to get the treat. Head over to downtown Ubud and check out the shops and the Ubud Traditional Art Market. If interested in yoga, many of the yoga studios offer free community classes. Paid classes cost between 100,000 – 130,000 IDR ($7.50 – $10 USD). For sunset enjoy a stroll on the scenic Campuhan Ridge Walk. Eat: If looking for some western food, get an amazing margherita pizza from Umah Pizza, the best in Bali! For local food check out Warung Pondok Madu. Budget Stay: Desak Putu Putra Homestay is an adorable family homestay. Room 1 has a tranquil private garden patio. The room is 175,000 IDR per night ($13 USD). Mid-Range Stay: Royani Villa is a private one-bedroom villa with private pool for $60 USD. While it gets crowded, the complex is huge, allowing for great pictures! 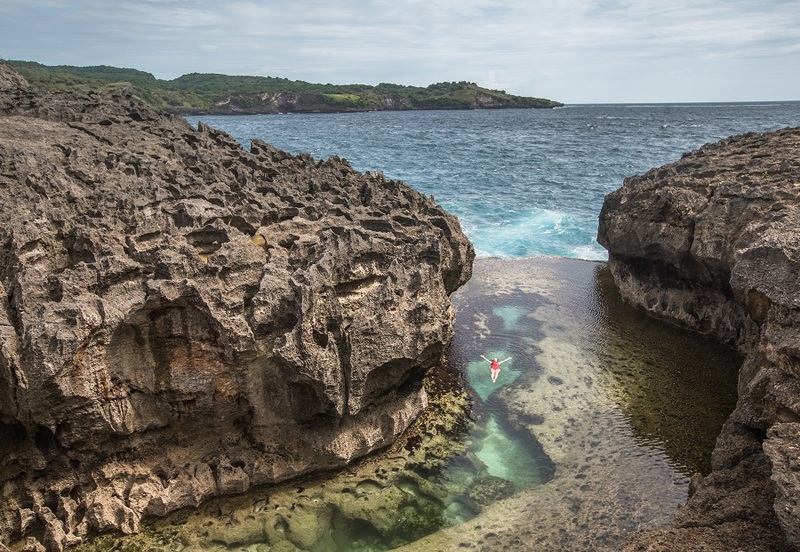 Explore: Today is about exploring central and north Bali. If you don’t want to be on a scooter all day, hire a driver. 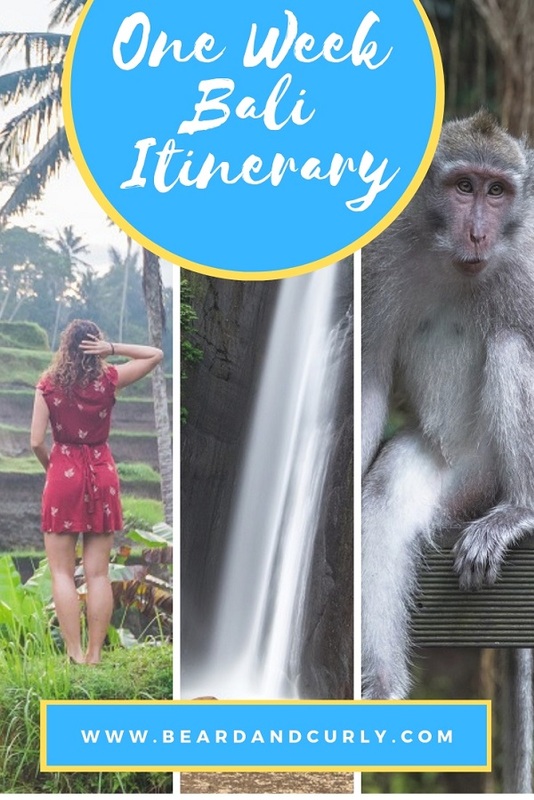 There are four stops: Jatiluwih Rice Terraces, Ulun Danu Beratan Temple, the Handara Gates, and the Nungnung Waterfall. First stop is the rice fields. Entry cost is 40,000 IDR ($3 USD) to this UNESCO World Heritage site. The rice fields are incredibly scenic with beautiful volcanoes in the backdrop. An hour north is Lake Beratan and Ulun Danu Beratan Temple. 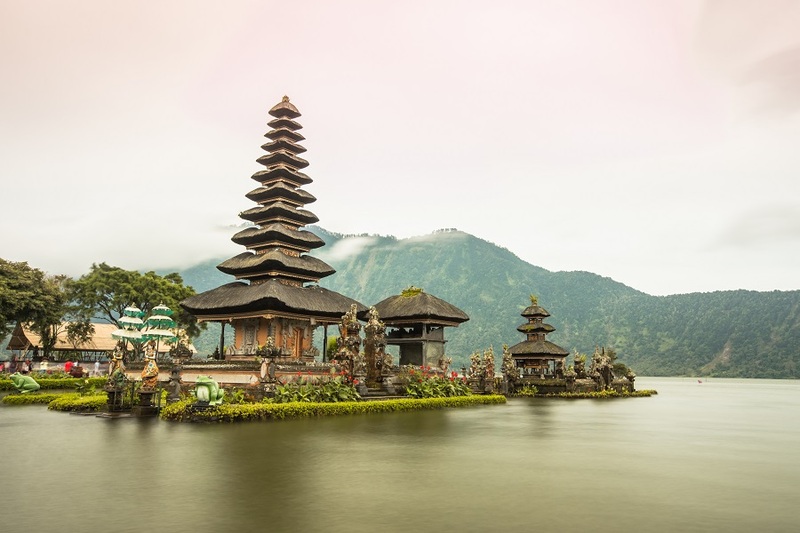 This picturesque temple seemingly floats on the lake. However, it can get very crowded. Entry cost is 50,000 IDR per person ($3.75 USD). Just a few minutes past the temple is the Handara Golf & Resort. 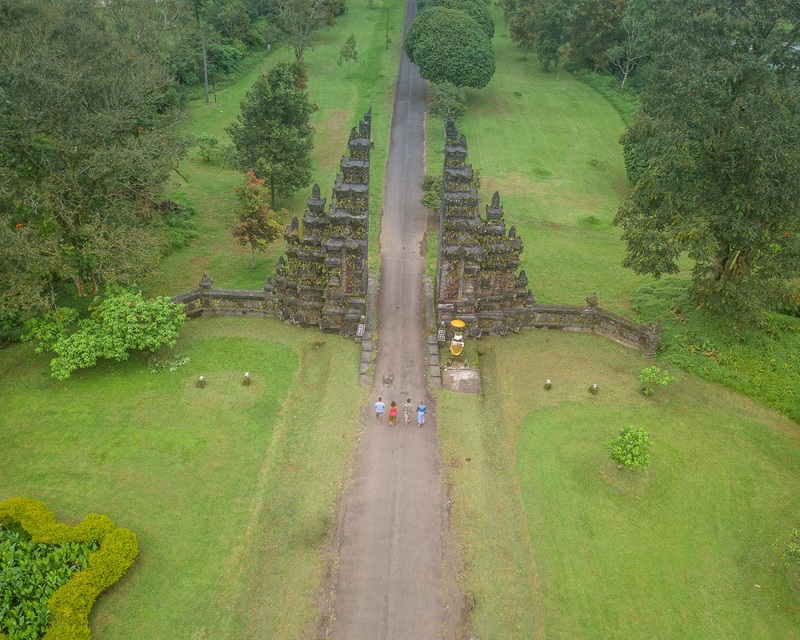 The entry into the resort is the famous Handara Gates, a popular Instagram location. 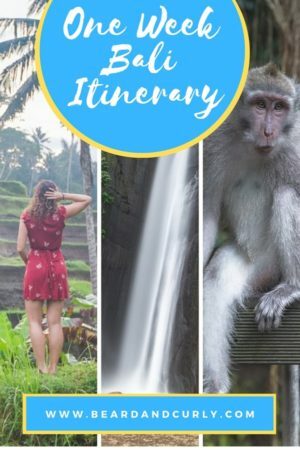 Snap a few photos and be on your way back to Ubud! On the way back take a short detour to the Nungnung Waterfall. Entrance fee is 3,000 IDR. It is a short hike with 500 steps to the waterfall, but entirely worth it! 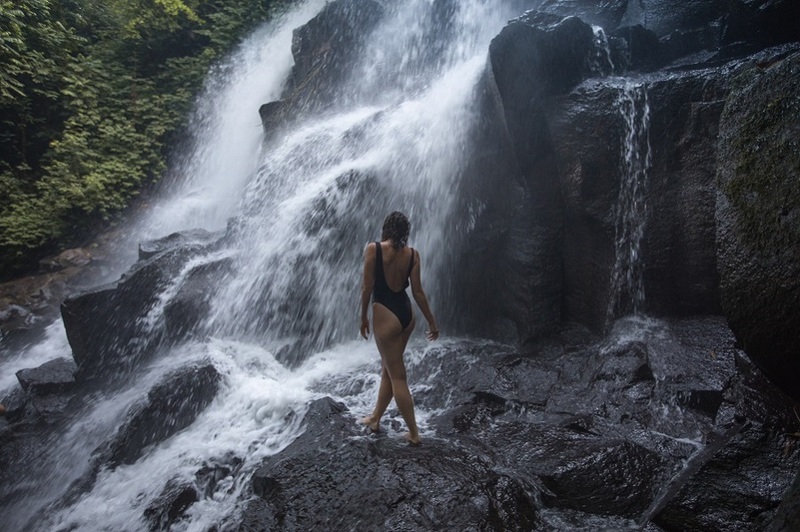 Enjoy a quick swim then be on your way back to Ubud. Eat: Eat some beef rendang or stewed jackfruit at Waroeng Bernadette. So yummy!!! 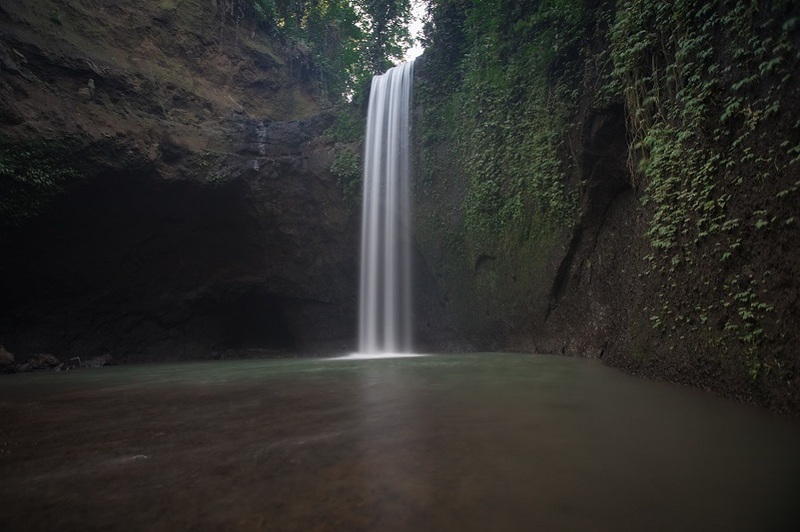 Explore: Hire a driver to the coastal city of Sanur with a few stops at waterfalls. 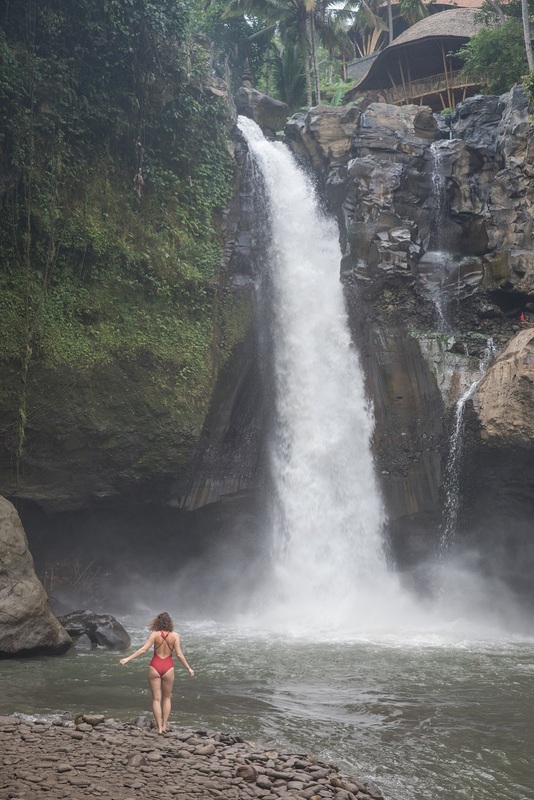 First head over to Tibumana Waterfall, roughly 30 minutes east of Ubud. Entry is 15,000 IDR ($1.13). 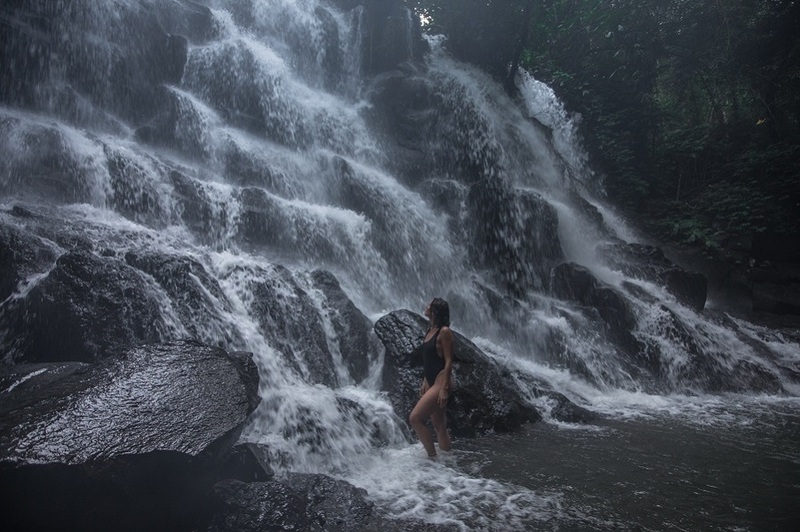 After a swim, drive 10 minutes down the river to Kanto Lampo waterfall, our favorite in Bali. It requires you to wade through the river waist deep, but it is totally worth it! 30 minutes away is the virgin cave waterfall Tukad Cepung. 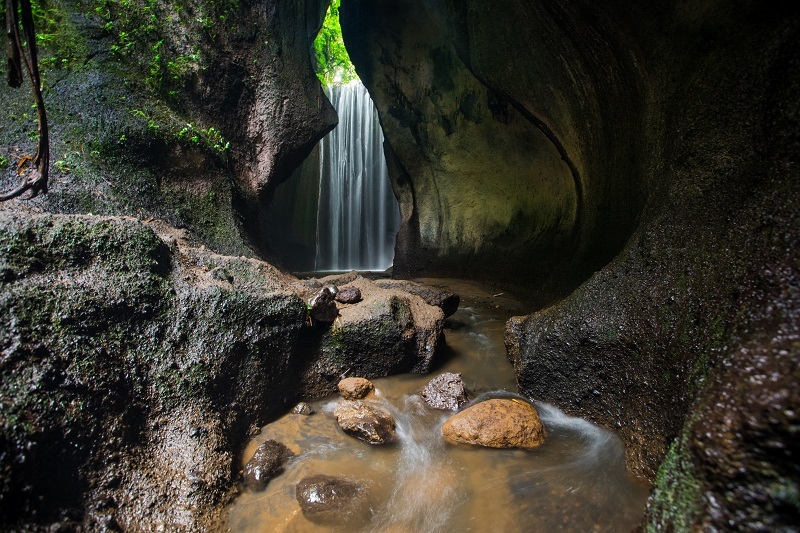 It is a fifteen-minute walk through the caves to this stunning waterfall. Entry is 10,000 IDR ($0.75 USD). If you have time, squeeze in Tegenungan Falls too, although this is the busiest waterfall so I would suggest it be the first to cut as well. Entry is 15,000 IDR ($1.13). Drive to Sanur and walk around the main street, Danau Tamblingan and enjoy a cheap massage from one of the many spas in town (1-hour massage 80K, $6 USD). Watch the sunset from Sanur Beach with Mt Agung in the distance. Budget Stay: Keke Homestay has nice double rooms for 250,000 IDR ($19 USD). Mid-Range Stay: Liko Ledo House is a nice private villa for $80 USD. To get to this side or standing on the waterfall at Kanto Lampo, wade through waist-deep water. Explore: Start the day early and hire a driver. It is a 2-hour drive to the Temple of Lempuyang Luhur. The entry cost to the temple is donation based, but 10,000 IDR ($0.75) is reasonable. The famous Instagram temple gates are just a 5-minute walk from the entrance. 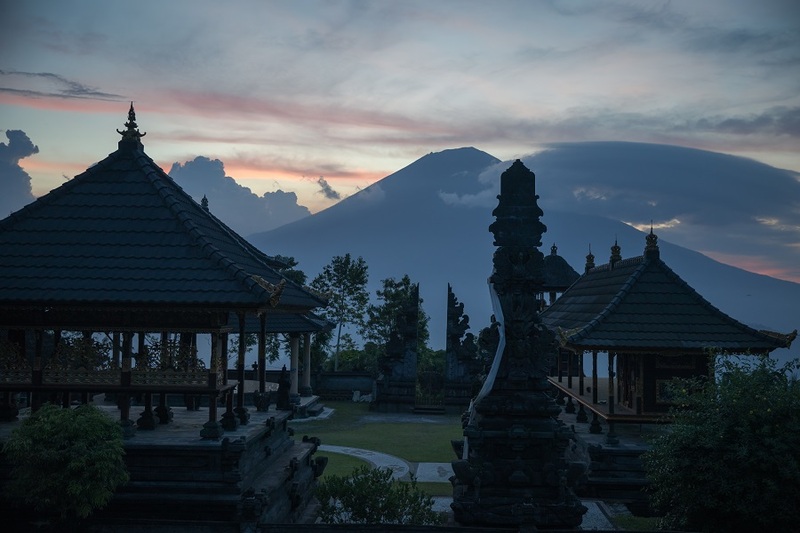 The views of Mount Agung in the backdrop are stunning. There are seven temples on this massive complex. 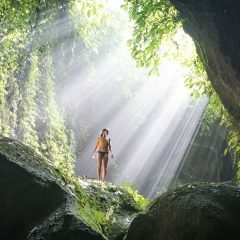 The first three temples can easily be explored. The remaining temples require hiking up a mountain which includes 1,720 steps. Hiking to the top will take 1.5 – 2 hours. 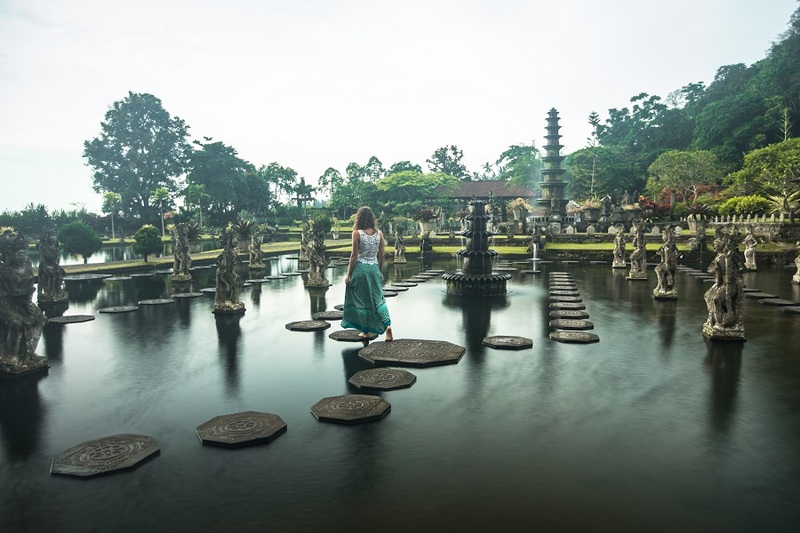 Following the temple, have a quick stop at the nearby Tirta Gangga Water Palace. Entry is 30,000 IDR ($2.25 USD). Take the scenic route back to Sanur and stop for drinks at Mahagiri Panoramic Resort. This is a great view of Mount Agung with rice fields surrounding the base of the volcano. Eat: If you want to test your stomach, check out the Sanur Night Market for some street food vendors. If not, just around the corner is one of our favorite restaurants in Bali (and super cheap!). It is called Bali Jepun Warung at 14 Pungutan Road. Their noodles are amazing! 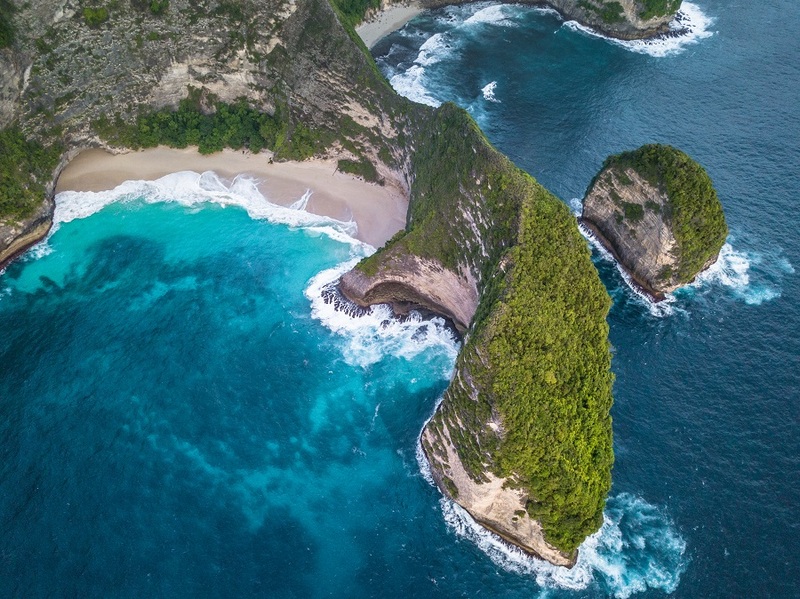 Explore: Today will be another long day to Nusa Penida island. Boats depart from Sanur Beach. It is possible to go independently or with a tour. Going independently is easy, however, it requires a test of your scooter skills. The roads on Penida are pretty treacherous. If confident in driving a scooter, it will be a fun adventure. For those not so confident, it is better to join a day tour that includes a driver. 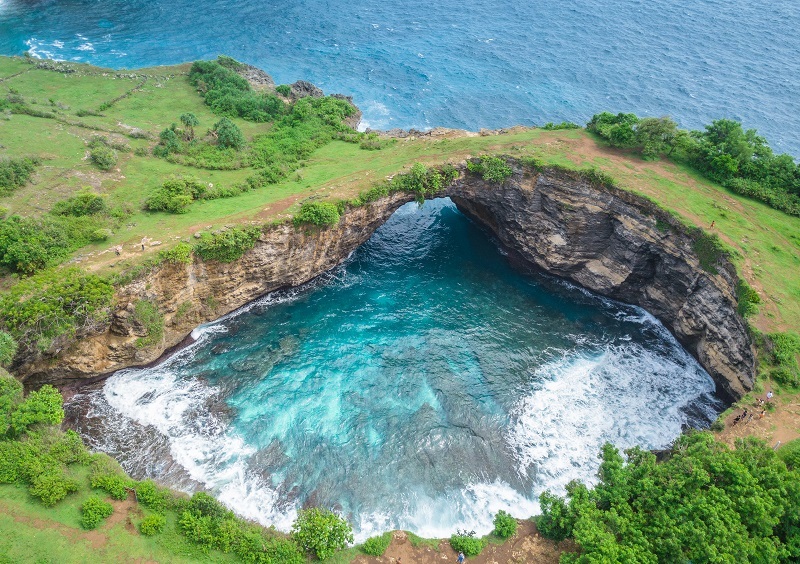 With time is on your side, spending a couple of nights in Nusa Penida is a great option. 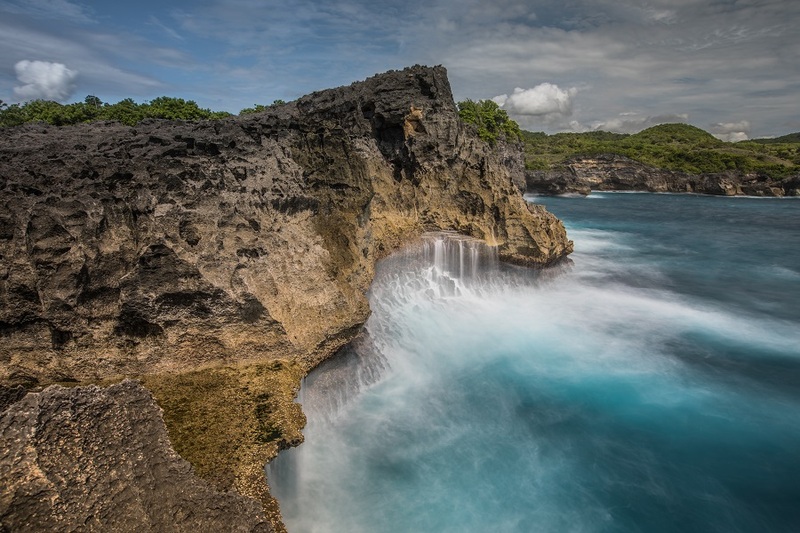 It is possible to also go to Nusa Lembongan. 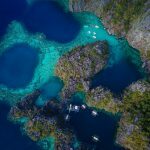 It allows more time to explore the island and stay at these beautiful places for sunset! Going Independently: Catch an 8 AM ferry directly to Nusa Penida with Maruti Express for 150,000 IDR. Pre-book the return ferry with tickets in hand before leaving the wharf. Upon arrival, rent a scooter for 60,000 IDR, which should include a full tank of petrol. No need to refuel. Consider going in the reverse direction of the day tours to see fewer crowds. First head to Kelingking Beach (5,000 IDR parking). Roads are pretty good and it should take one and a half hours. Instead of adding a third stop at Crystal Bay, hike down to the beach for a couple of hours. Although the path looks gnarley is fairly safe and the beach at the bottom is definitely worth it. After Kelingking, head to Broken Beach. This is one of the worst roads on the island, so be ready for an adventure. They were paving a large section in December 2017, so it is improving quickly. Explore Broken Beach and Angel’s Billabong (5,000 IDR parking) in the afternoon when all the tours have left (usually by 2 PM). After soaking in the views and going for a swim, head back to the wharf (1 hour 15-minute drive) for the return ferry. Total estimated cost: 400,000 IDR ($30 USD) per person including a meal and beer. Joining a Tour: Tours leave Sanur around 9 AM. They come fully inclusive of boat transfers, a car, and driver in Penida, entrance fees, and lunch. This is the best option if you have reduced mobility or are worried about driving a scooter on horrible roads. While the distances are not far, it takes over an hour between each stop on the tour. 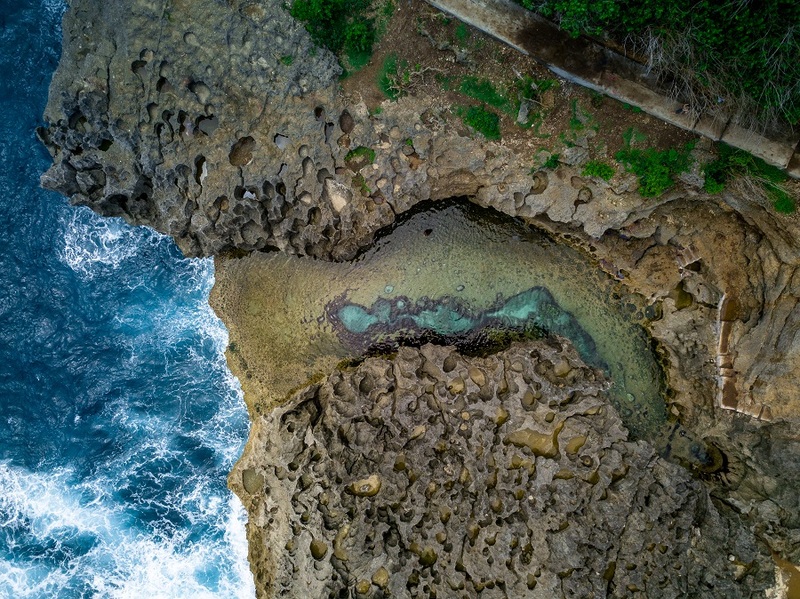 Tours typically go to Broken Beach and Angel’s Billabong for the first stop. 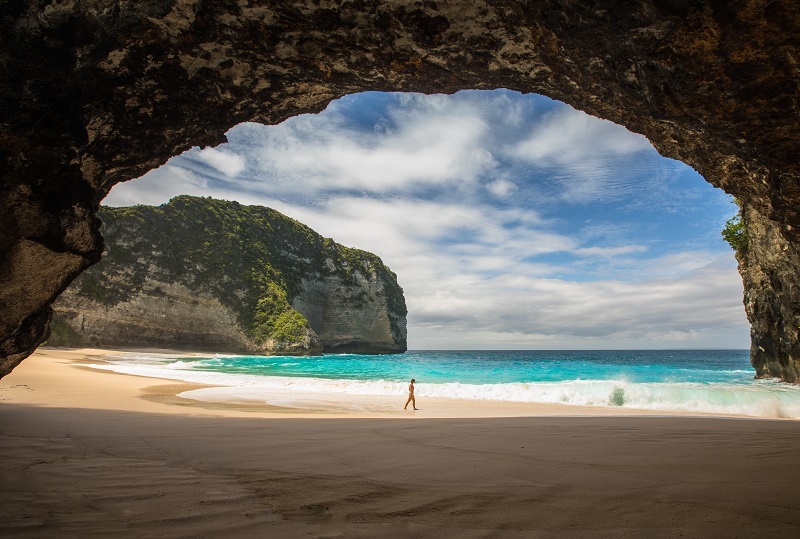 After enjoying a swim in the natural pool and incredible views, the tour continues to Kelingking Beach. The last stop is snorkeling at Crystal Bay. Boats depart back to Sanur between 4:30 PM and 5:30 PM. 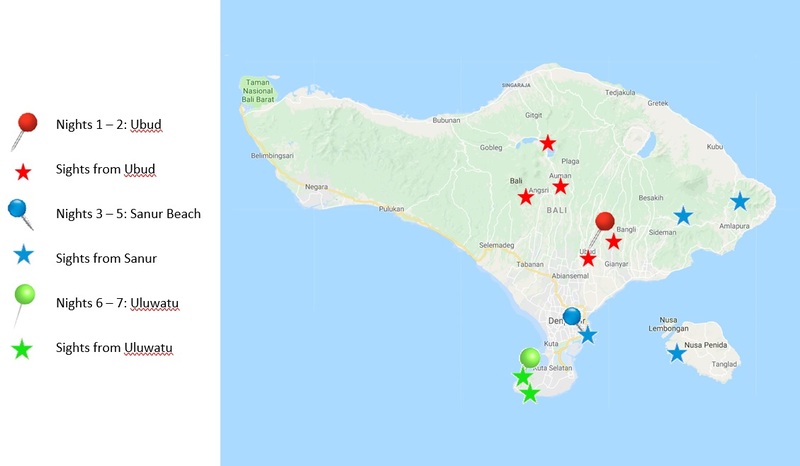 Total estimated cost: tours range between 800,000 and 1,200,000 IDR ($60 – $90 USD per person), but should cost lower if booking directly in Sanur. Explore: Today is about relaxing. After a few days of some serious sightseeing, it is time to head to the beach. It is a one hour drive to the beach town of Padang Padang, one of the best beaches in Uluwatu. It’s possible to visit one of Bali’s abandoned airplanes on the way down. 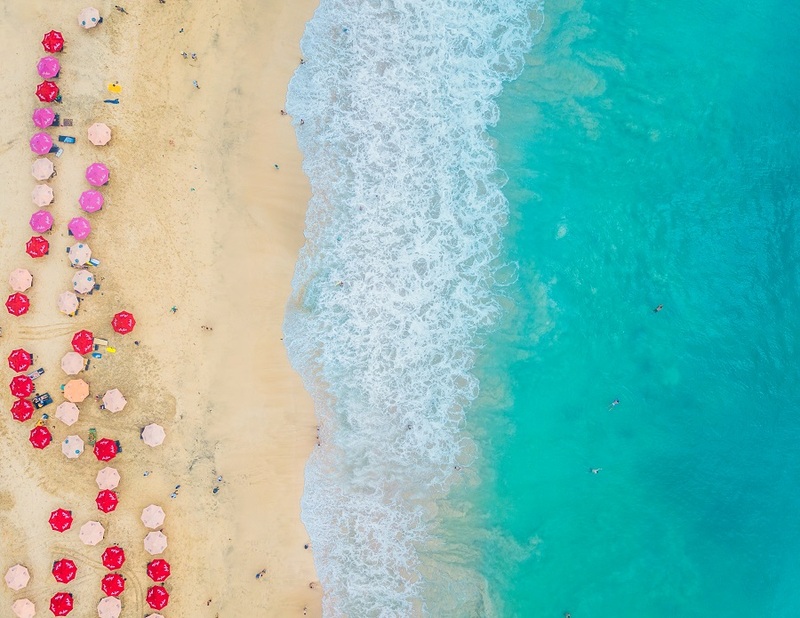 After checking in to a hotel, head to the beach to chill for the day. Entry to the beach is 10,000 IDR per person ($0.75 USD). If you really want to relax, stay for the day and watch the sunset from the beach. 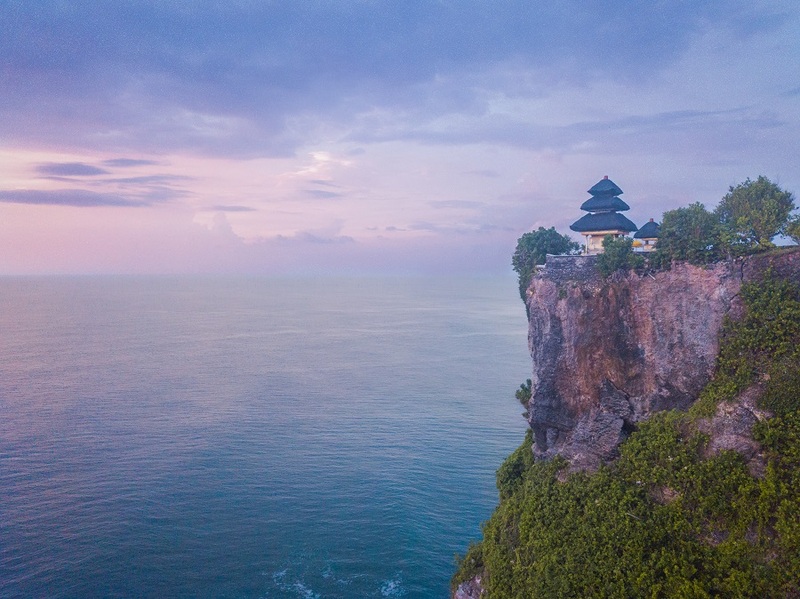 If you want to venture off and see something, the Uluwatu Temple is a 10-minute drive. It is a beautiful temple perched on the side of a cliff. The entry cost to the temple is 20,000 IDR ($1.50 USD). Eat: Just next to the homestay is Bukit Cafe or check out some other incredible restaurants in the area. Budget Stay: Devata Giri Homestay is located near several restaurants and just a couple of minutes from Padang Padang Beach. Double rooms are 200,000 IDR ($15 USD). Mid-Range Stay: De Sapphire Cliff Villa is a beautiful villa with rooms between $50 – $70 USD. For a private villa, Villa Impossibles is next to the lovely Bingin Beach. Explore: Today is another beach day, yayy!! Scoot over to Dreamland Beach. It can be a little difficult to find. It is near a lot of huge resorts that are under construction or abandoned. Look for the road with a security guard at the entrance. Parking costs 5,000 IDR. The beach has a warung on site (40,000 – 90,000 IDR for food, $3 – $7 USD), as well as beach umbrellas to rent (100,000 IDR for the day, $7.50 USD). A few minutes past the umbrellas you can have the beach almost entirely to yourself. After getting your tan on, the only other activity for the day is to watch the sunset. 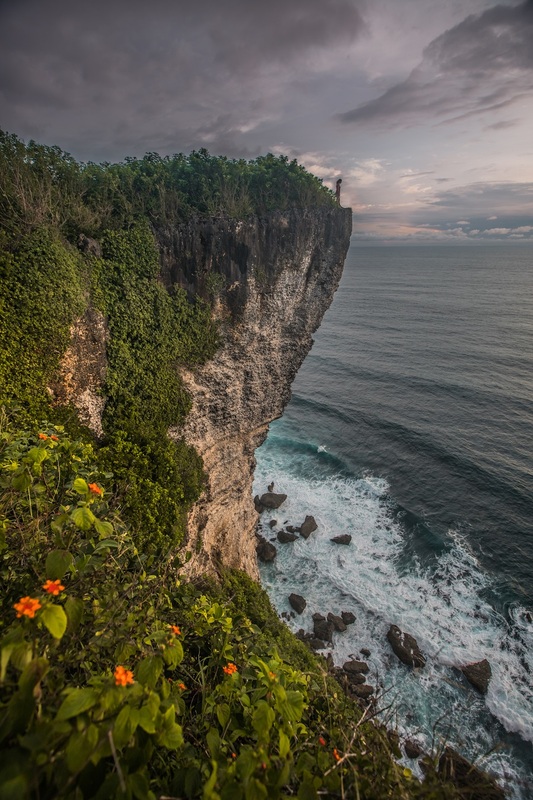 Head to the Uluwatu Cliffs, known in Balinese as Tebing Karang Boma. The impressive cliff has unobstructed views of the sunset. Uluwatu Temple is seen in the distance. 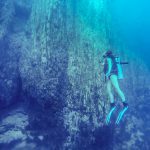 This a popular Instagram site of a person standing on the edge of the cliff. Eat: If you are enjoying the local Indonesian food, then check out Warung Heboh Padang Padang. It is one of our favorite Indonesian restaurants in Bali. It can be a little confusing on the pricing because it is self-serve. Each dish has a cost per scoop. We saw some people taking really small scoops, but trying 10+ items. This can easily get over 100,000 IDR ($7.50 USD) per plate. We are cheap so we stuck to bigger scoops of few items. We usually spend 20,000 – 30,000 IDR per plate ($1.50 – $2.25 USD). Budget Stay: Devata Giri Homestay is near several restaurants and just a couple of minutes from Padang Padang Beach. Double rooms are 200,000 IDR ($15 USD). Mid-Range Stay: De Sapphire Cliff Villa is a beautiful small resort with rooms between $50 – $70 USD. For a private villa, Villa Impossibles is next to the lovely Bingin Beach. Hire a taxi or take Uber/Grab back to the airport for around 150K IDR ($11 USD).